It hasn’t been for the want of trying. Numerous blog posts have been written, emails and DMs exchanged, and meeting with senior ministers held. This blog has been at the forefront. But still the Government refused to see what just about every Christian in the country had eyes to see: that David Cameron said nothing and did even less while tens of thousands of Iraq’s Christians were summarily slaughtered or driven from their ancient homelands. But the moment the Yazidis were stranded up Mt Sinjar, the Prime Minister was convening his Cobra emergency committee and announcing to the world that Britain would play a leading role in their rescue and relief. We even sent the SAS. What is this incoherent foreign policy? Who determines this hierarchy of suffering? It is as though the Government couldn’t give a damn about Iraqi Christians. But the Yazidis are a syncretic Zoroastrian tribe. They are mysterious and cool, and there is kudos to be had in saving the exotic minority. The Christians are knowable and familiar. And therein lies the contempt. 5. Underlying these concerns is the need for reassurance that a commitment to religious freedom will remain a priority for the Government, given the departure of ministers who championed this. Will the Foreign Secretary’s Human Rights Advisory Panel continue under the new Foreign Secretary? Is this not the time to appoint an Ambassador at Large for International Religious Freedom – which would demonstrate the Government’s serious commitment to developing an overarching strategy (backed by expertise) against Islamist extremism and violence? “Or are we simply reacting to the loudest media voice at any particular time?” the bishop asks. Of course, we all know the answer to this. Most of the mainstream media segued straight from Gaza to Mt Sinjar; from bombed-out Palestinians to the massacre of Yazidis. They said little, if anything, about Mosul, and one doubts they have ever heard of Qaraqosh. The Government tends to react to the obsessive minority passions of the BBC, Guardian and Jon Snow, all of whom manifest a pathological anti-Christian bias, born of theological ignorance and spiritual indifference. But to say that the Government’s policy in Iraq is incoherent, ill-thought-through and determined by “the loudest media voice at any particular time” is brave, coming from a bishop. No doubt some will raise a highly-polished mirror, point the finger and cry “hypocrite!”, reminding us that the Church is mired in its own inconsistencies, confusions and contradictions. And perhaps there is in the Church’s own muddles and murkiness a temporal reflection at the heart of the State. But this is not a time for divisive diatribes of denunciation. Christians are dying in their thousands. even now, in the relative safety of their Kurdish camps, where they sweat in their fevers and faint from thirst and malnutrition. And David Cameron stands accused by a senior bishop of the Church of England of abandoning them. And that accusation is justified, because the Yazidis have consistently taken political precedence. The Government has created a hierarchy of suffering in which 30,000 Yazidis trapped on Mount Sinjar trumps 100,000 Christians fleeing the murderous Jihadists who invaded Mosul and Qaraqosh. 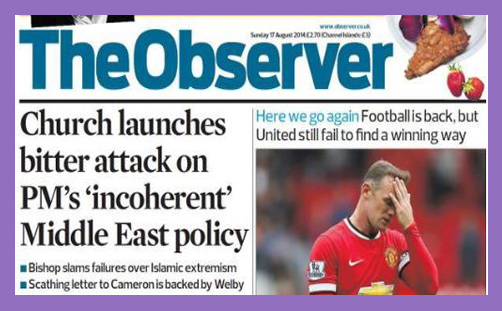 For Cameron and his Government, the Christians have indeed “fallen from consciousness”. There has been no response to the bishops’ plea that we open our borders to asylum seekers. France and Germany are offering sanctuary, but the Bishops of Leeds, Manchester and Worcester haven’t even received an acknowledgement of their letter. Bishop Nick says this is “something that causes me and colleagues some concern”. Frankly, it causes His Grace consternation, disillusionment and dismay. Christians are being crucified in Iraq for nothing more than believing in Jesus , and the Prime Minister can’t even be bothered to convene a committee.